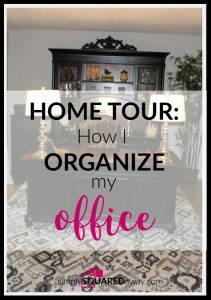 Home Tour: How I Organize My Office - Paper, office supplies, files, etc. Here it is. 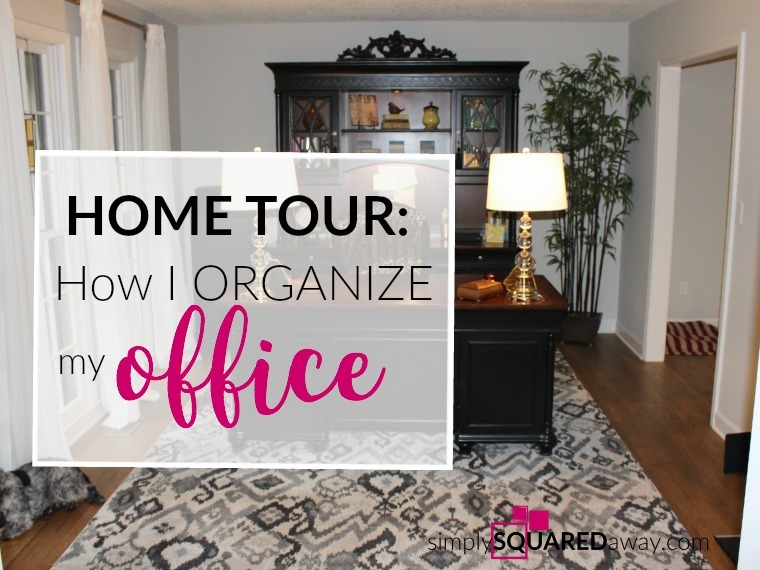 The next step on my home tour how I organize my office. You can see how I organize my kitchen here. A few years ago we made the decision to make our front room, previously a formal living room, my office. It was the best decision ever. I love having my office area on the main floor. All the papers that come into the house stay right in one area. I’m able to process them immediately, placing them on my desk to take action or filing them in the file drawers or tucking them in a 12×12 box to go down to memorabilia later, etc. The downfall is there are no doors on the room so if people are home it can be noisy. You may find me hiding in my bedroom if I’m on a phone call. We recently updated/renovated our main level. The hardwood floors are new and we have fresh paint on the walls, ceiling and trim. I had the desk and credenza already but did purchase a new rug. 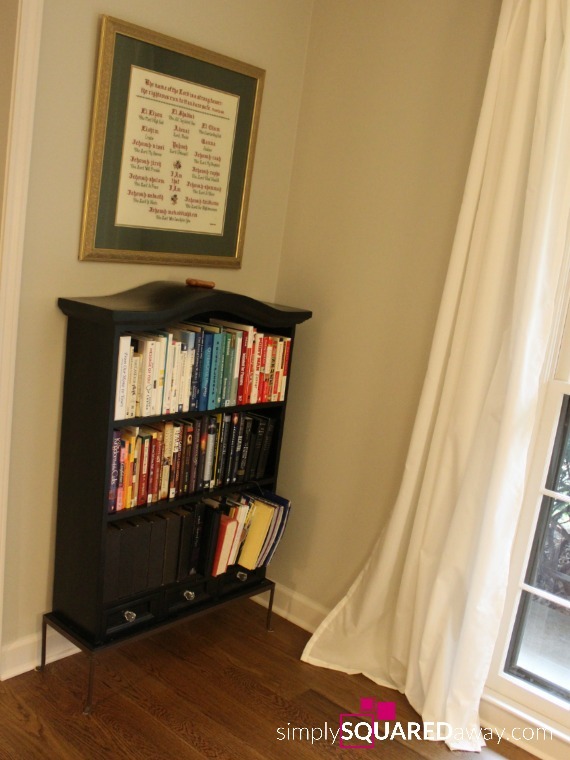 We moved the little book shelf in from another room and the lamps down from our bedroom. 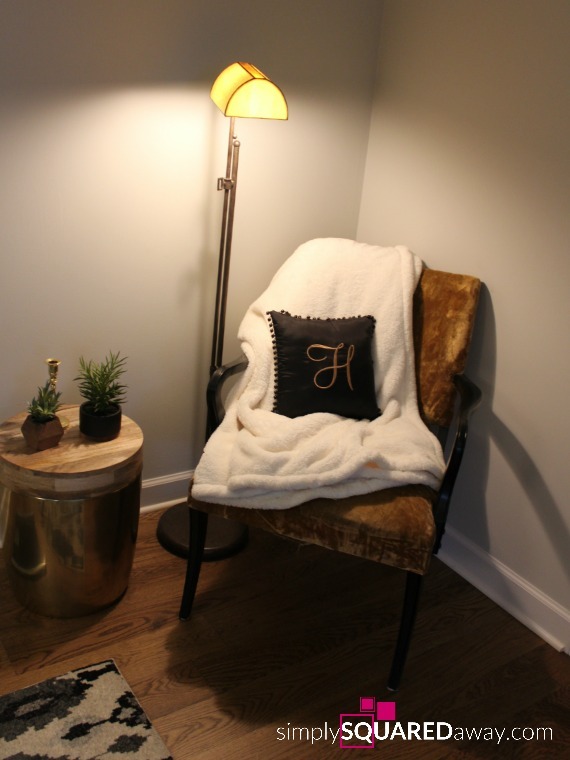 The gold, velvet chair is from my husband’s grandmother. Jennifer Allwood suggested I paint the arms and legs black a few years ago. When I was deciding on the office furniture, I wavered back and forth on what style to buy. It was a huge decision. I wanted to have enough storage for everything so I finally decided on the Liberty Jr. Executive desk set. I’ve loved it. Of course, sometimes I wonder what a more modern white desk would look like. 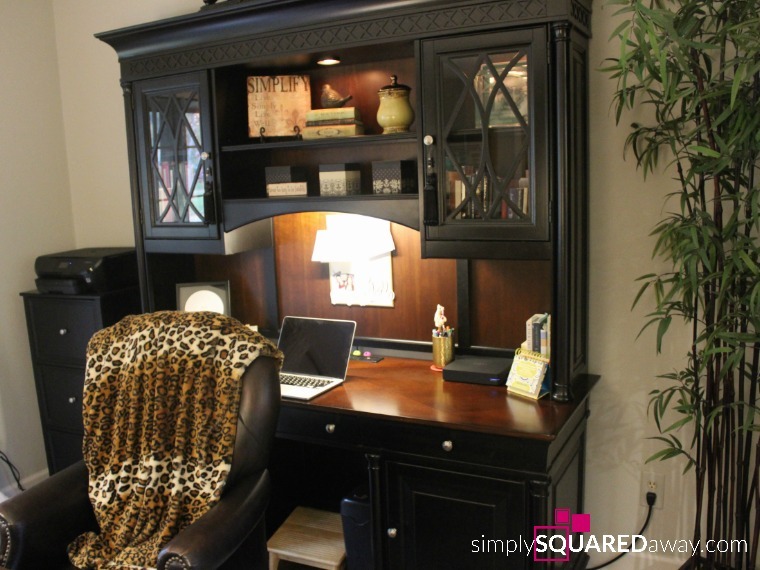 If you are looking for office furniture here is a page with desk options: an executive desk more like mine, a kidney shaped desk or even a Paris vintage writing desk. Always think through storage when deciding on furniture investments. Overall, after several years, I’m thankful for the storage I have and still love the classic style. I’ll start by showing you what I keep in the credenza. What is a credenza? The credenza desk is often placed against the wall immediately behind or perpendicular to the main desk, but close enough that the user can reach it from the seated position at the main desk by simply swivelling and wheeling their office chair over to it. 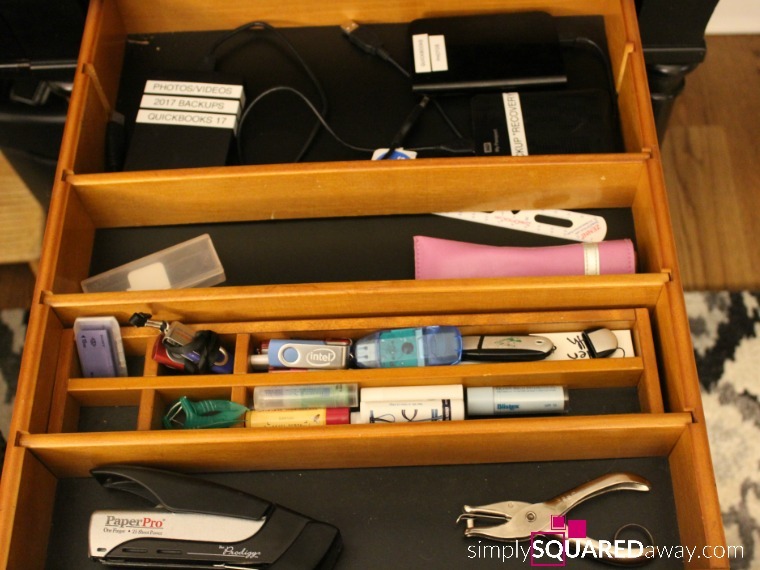 Now, here’s what I keep in the drawers and how I organize my stuff. I’ve tried to link to as many items as I can, some are affiliate links, for your convenience. 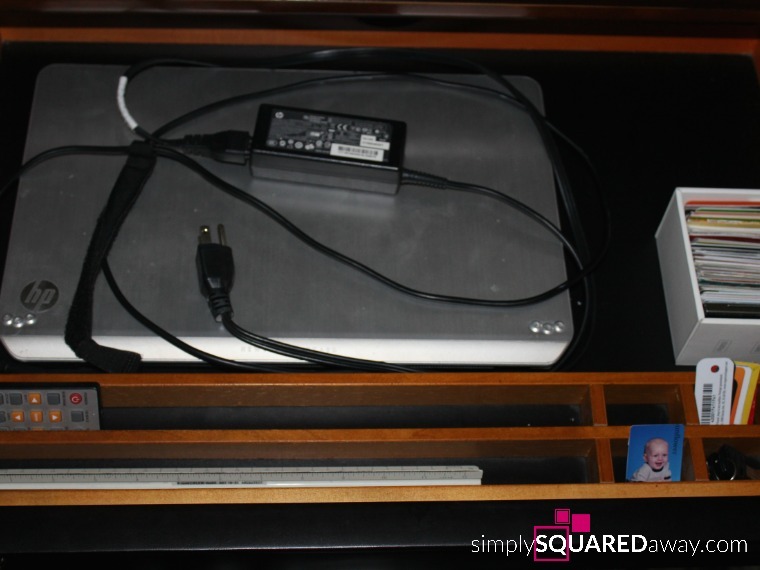 This drawer on the right is where I keep some of my electronic storage: external hard drives and all my flash drives. I also have things I get to often like chapstick, floss picks (here are my favorite that I cannot live without), the stapler, and hole punch. 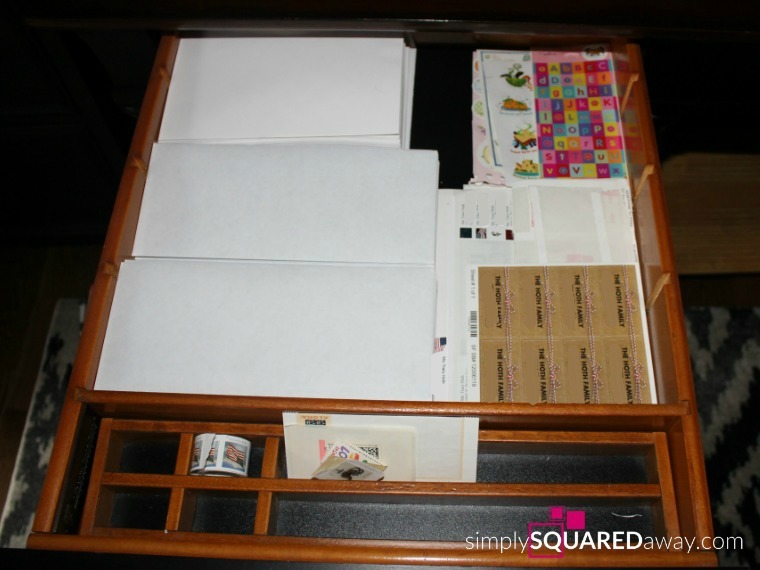 The drawer to the left is my mailing drawer. It only holds envelopes, stamps and return address labels (and some stickers that I should throw out because I haven’t used them in over a year). Everyone needs to have an area designated to these three items. It could be a hanging file, a box, or a drawer. 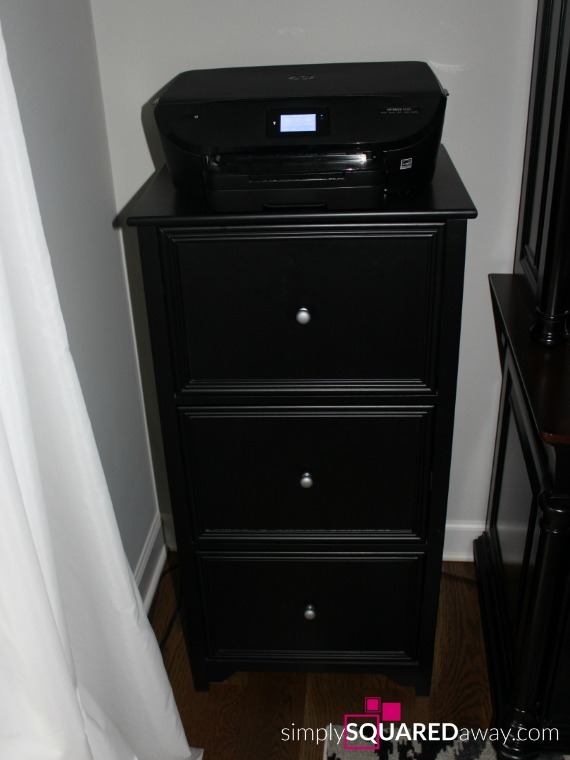 The center drawer is where I store my computer case and wireless keyboard. I put my laptop in here when I want my desk cleared off. I have a cabinet on each side, under the drawers. One is designated to checks, greeting cards, printer paper (in the red and tan box) and a temporary 12×12 box (black) where I store memorabilia and photos until I take them down to file in our individual memory tubs and photo boxes. I keep those in my basement storage room. Here are several styles of my favorite storage boxes with lids. I’ve had these metal bins for so long I can’t find them to link to but you could use these traditional photo boxes with lids. They come in all colors and they look great on shelves plus you can stack them. They work great for receipts, photos, checks, etc. 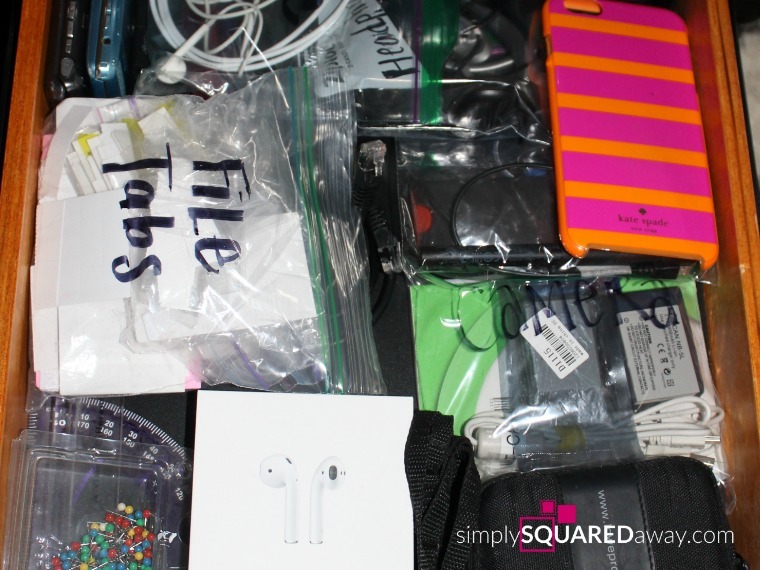 Designate one box/location for each of these items to stay organized. 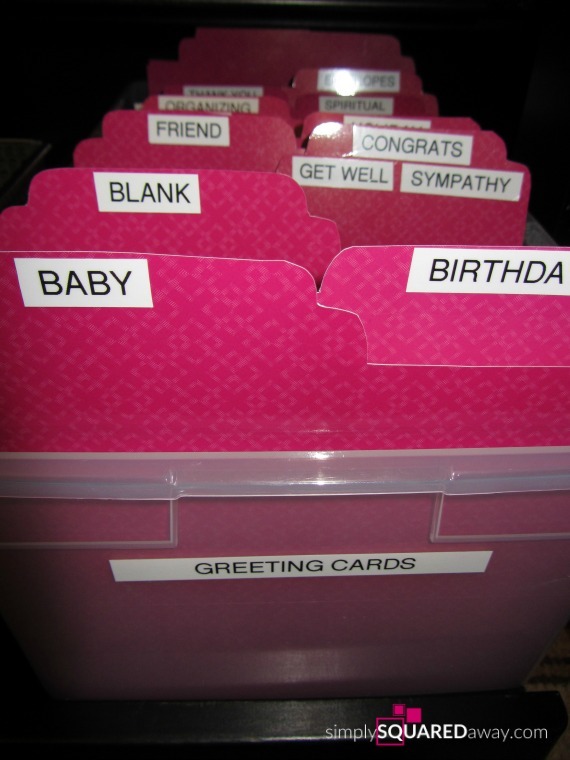 I organized my greeting cards using this bin (also my favorite bin for a deep shelves like in a pantry) and made the dividers by cutting and labeling some old page dividers that I was going to throw out. The other side is designated to ink (I use this ink service which has saved me a lot of money and ink is delivered to my door), 4X6 photo paper, school supplies, labels, and random other things that I clipped together by category and labeled (this is my favorite label maker). I try to keep the credenza as clear as possible but it does get messy. Here it was before I cleaned it up and took pictures. I always seem to have a pile of books I am reading, or want to read. I usually put the paper I need to take action on in a pile on the right. Sometimes on the left side I’ll pile things I need to file. But, because I can’t tolerate surface clutter I clean it off regularly – every few days – and it only takes 15 minutes or so. There is a place for everything already designated so I can quickly clear it all off and put it all away. 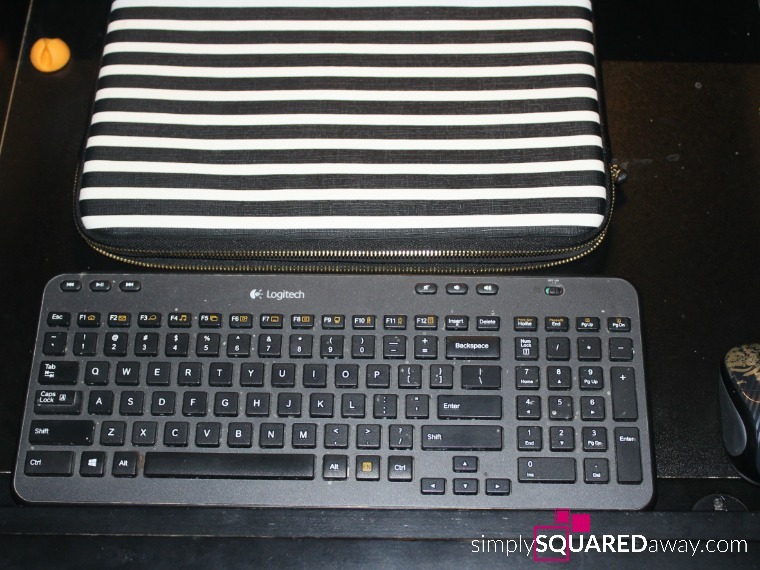 If you are the type that doesn’t notice clutter you need to get some systems in place to help you maintain a clutter-free desktop. It feels amazing. You focus better. You don’t panic when company drops by. 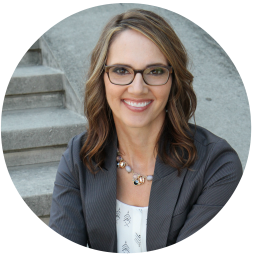 RELATED COURSE: If you are ready to tackle your paper clutter take my Paper Bliss course here to learn how to reduce paper, organize what you keep, and create systems that help you maintain. The right one has random books. Some are my favorites (like this one) and others are devotionals or have quotes that I refer to. Some are books I plan to read soon or I am reading but I don’t want them out on the desktop. 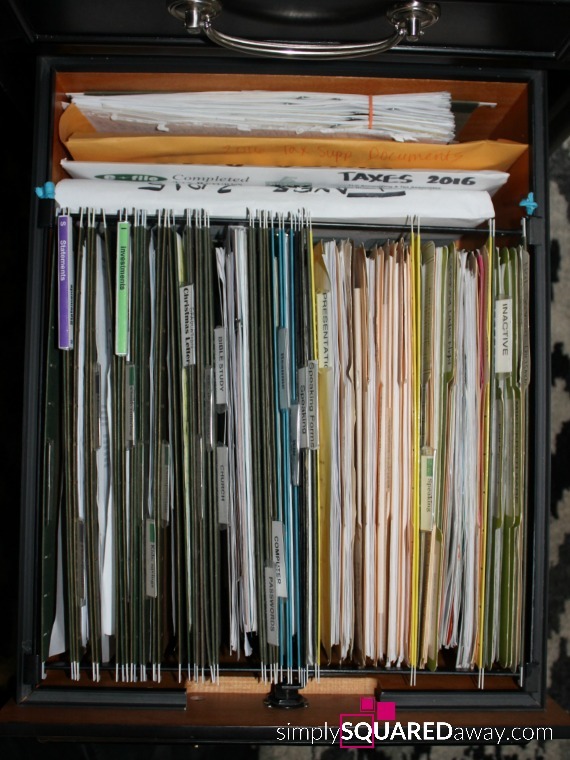 There are a few old journals that I need to scan through and do something with – either shred, throw or put in my memory tub. 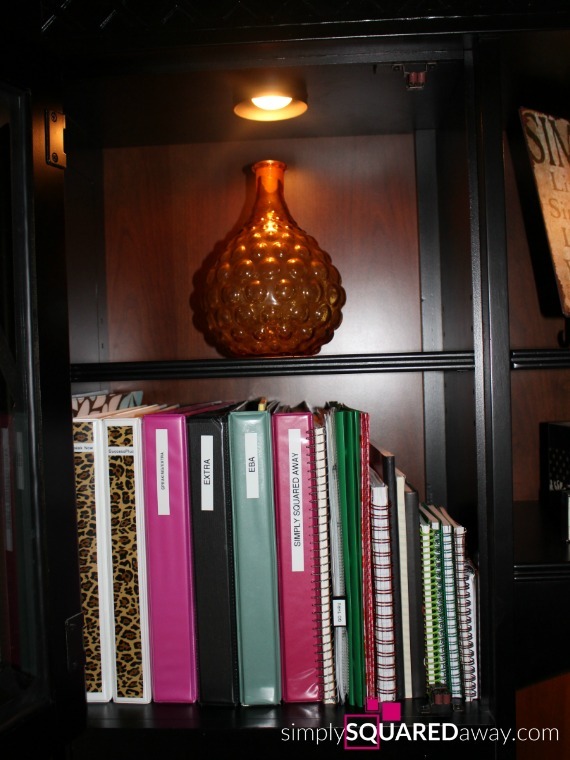 The other side has binders that I refer to and some that I haven’t looked at and just leave them because I might someday want to look at them! 🙂 It also has extra little notebooks and journals. There is one notebook that has a record of when my sister and I spent time reading the classics. We made a list of books and started reading. I took notes on each of the books we read. That was about 10 years ago! It makes me happy to look back through it so I leave it up there because I don’t know where else to put it. Can you relate? Do you have anything like that? TAXES – This is the first file. I throw donation receipts and any tax related papers in here. It’s easy to grab when it’s tax time. FAMILY – One file for each family member that holds immunizations, medical records, school papers, etc. Then, a college file for my oldest son that I started when he was a senior. And a medical file for my second son because he had a lot of papers I needed to keep. HOME – includes all home repairs, HOA, etc. INSURANCE – our car, home and life insurance. CAR – each car has it’s own file. INVESTMENTS – current statements kept here. The bottom two drawers hold client files in alphabetical order. In one corner of the room is the only book shelf in our home. Look, I organized the books by color! 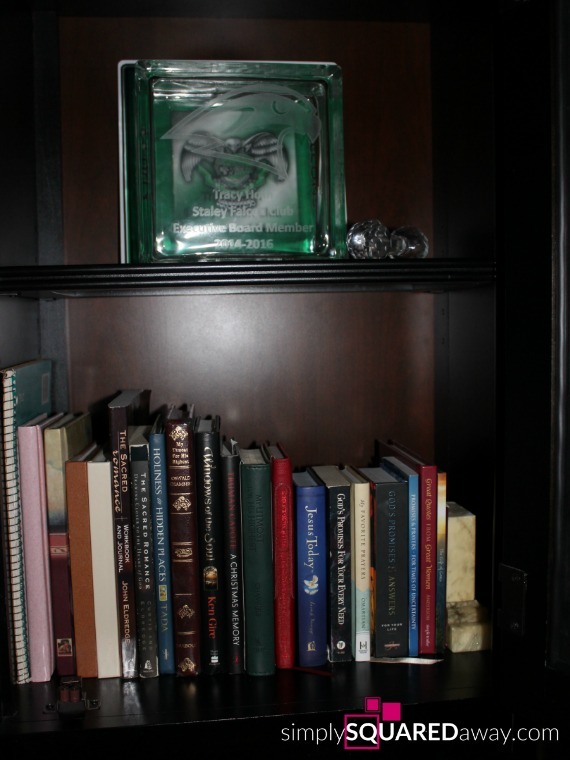 On the bottom shelf are some photo albums and the kids’ yearbooks. The framed art is cross-stitched names of God that I cross-stitched a long time ago. This beautiful woman from my church helped me wash it and roll it and then I had it framed. It makes me happy. I can’t believe I used to cross-stitch! The other corner has a little sitting area. 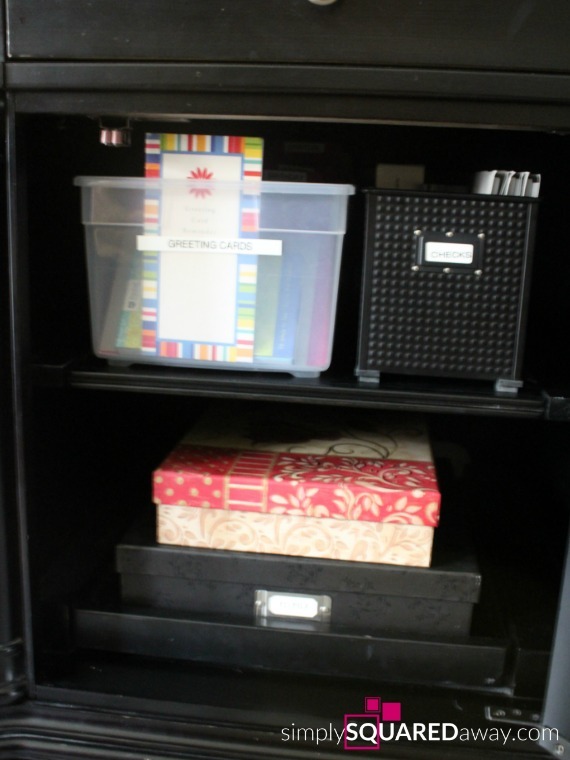 I have 2 file drawers, 2 drawers above each file drawer and a center drawer. 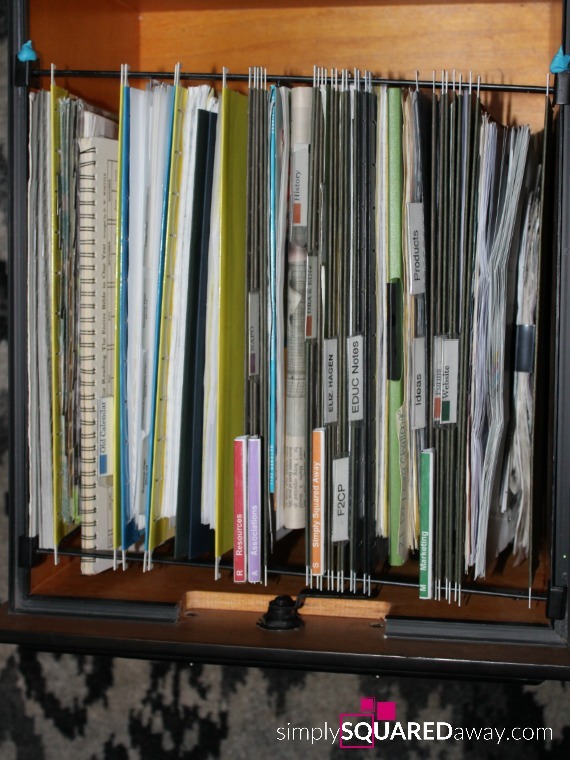 One file drawer holds business files. I need to clean many of these out because I don’t use them anymore. There are a few valuable ones where I keep my business license, EIN number, all my receipts and statements for QuickBooks, and forms for client files. In the other drawer I keep my speaking files and a few more personal files. In the back of the drawer I keep my final tax folders for the most recent years. They have come in handy. It looks like I have a lot of writing utensils. I guess I do! Wow. 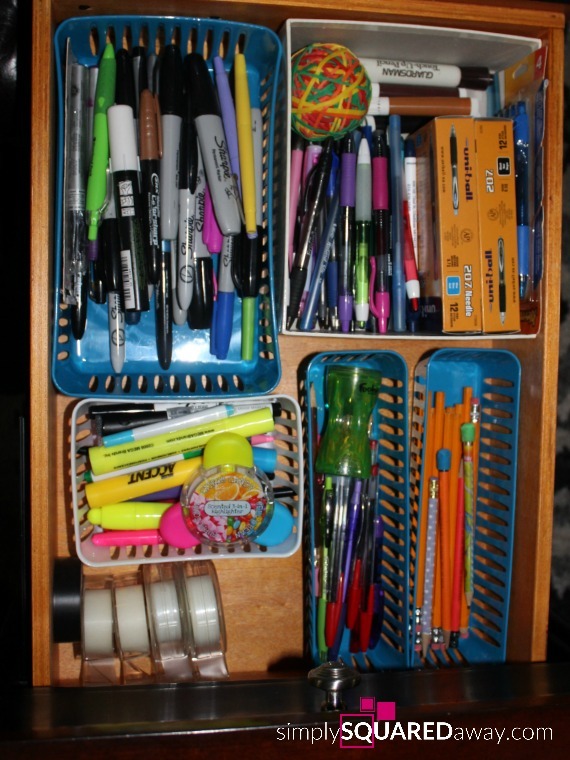 I’ve organized them (pens, pencils, highlighters, markers) in containers I already had. Right above those are my most used supplies. 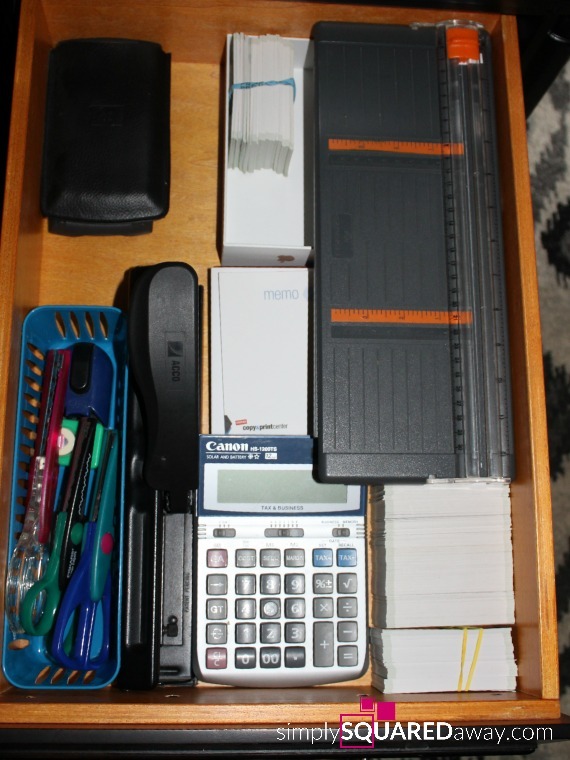 On the other side I have a drawer that holds cutting instruments, calculators and my business cards. Right above that is my electronics drawer (and pins!?). This looks messy but everything is bagged and labeled. 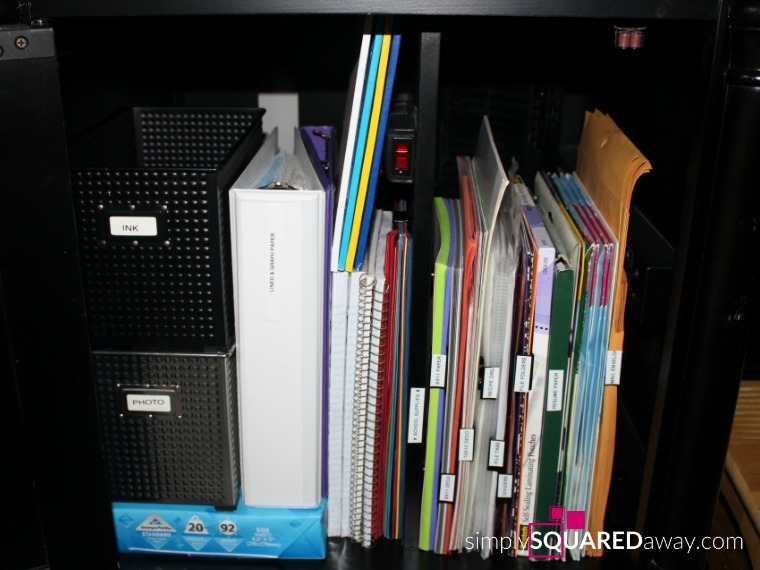 First, when organizing your office or any space, look at what kind of space you have available to organize. Is it vertical space? Drawers or shelves? Is it limited so you need to consider alternative options like behind the door? Do you have a closet you can use? Second, always try to use products you already have before you purchase anything. Then, consider what additional products would be useful. Over-the-door organizers if you have a door. 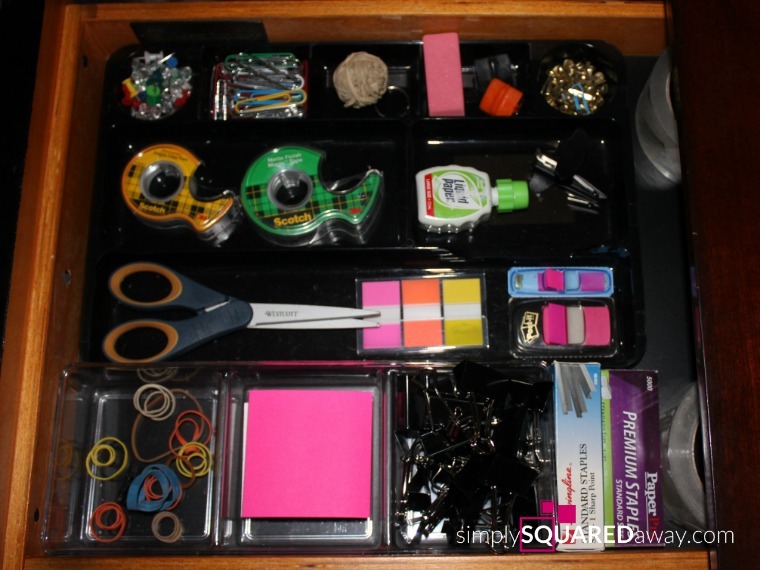 Drawer organizers – Be creative and use what you have first. Also DIY your own containers using check boxes, cellphone boxes, cut cereal box bottoms, etc. 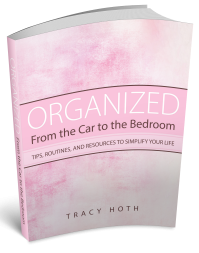 If you want coaching or one-on-one organizing help to create an organized office you love please contact me here. Finally, add your very favorite things to your office. 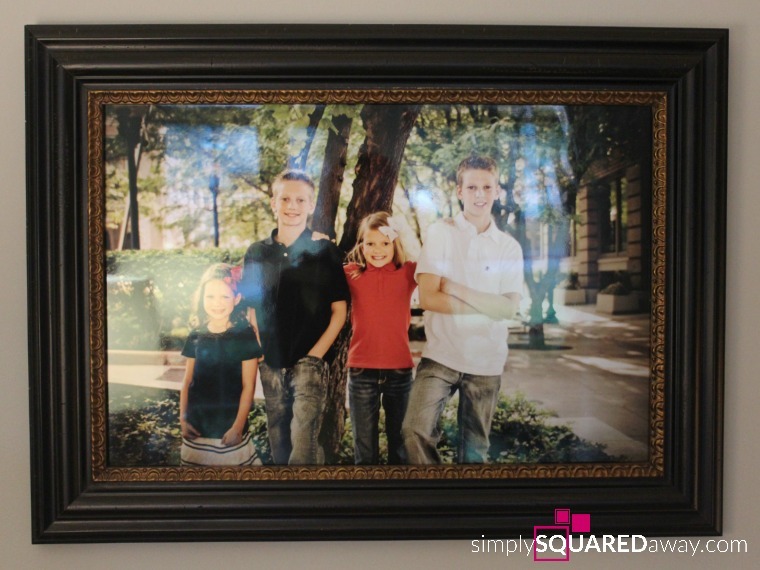 This is my absolute favorite picture of my four kids. LOVE. 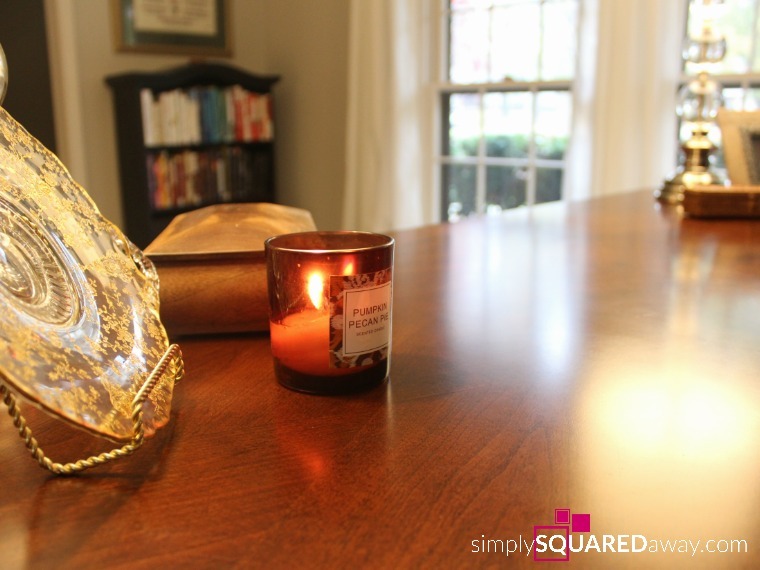 Simplify your space. Add a few of your favorite things. Rejoice and be grateful for what you have been given. Use it to add value to the world! Please email me or comment below if you have any questions. Happy organizing! Beautifully organized and furnished Tracy! Thanks for showing us around. I like the binder clips you labeled and used to keep office supplies neat. My drawers need a bit of work and you’ve inspired me. This is very inspiring! 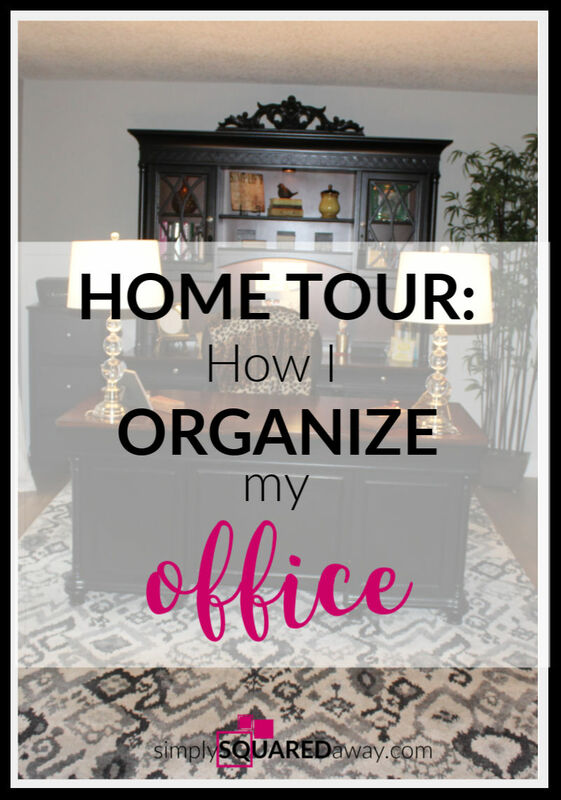 I want to have a well – organized office too like your yours. I’ll start to fix my desk right now. 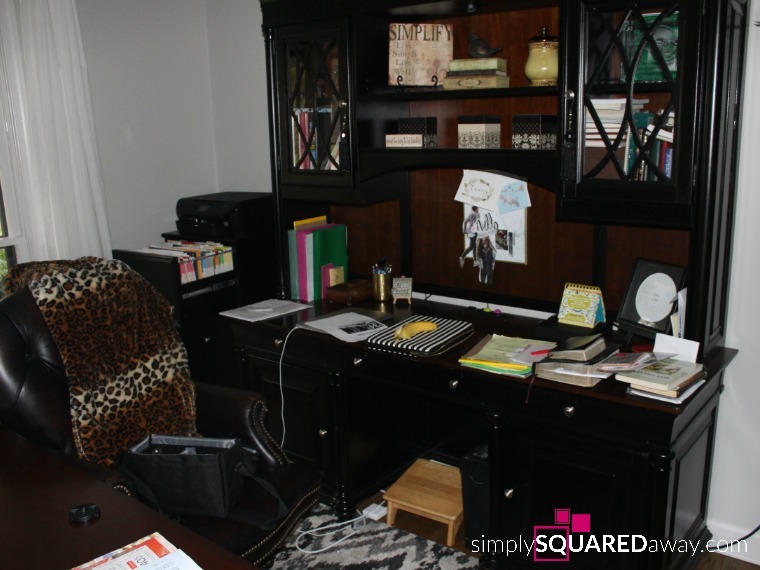 I believe that it is really a must that we have a clean and organized office to work comfortably. Thanks for sharing this article. Thanks! Yes, start now! 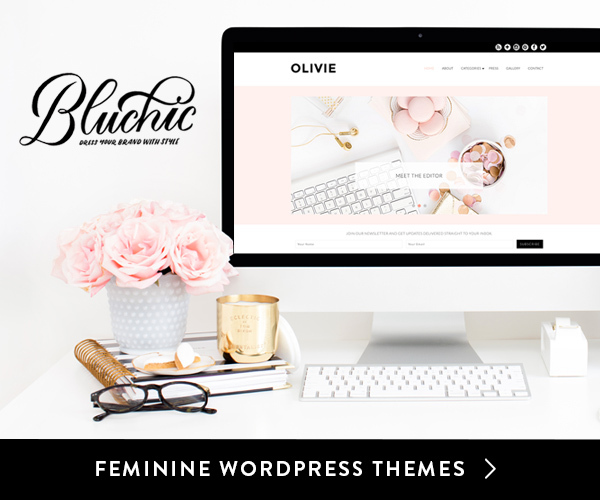 🙂 Clean AND organized…there’s nothing better to help you get work done.